Gouache on paper, mounted on board, 27 x 21 cm (10.6 by 8.3 in). Signed and dated "1911". 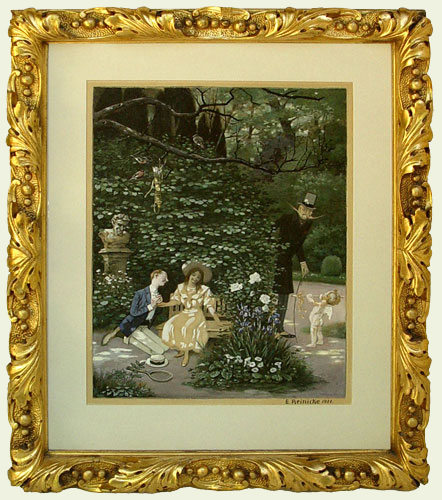 Period very decorative frame with baroque style ornaments. 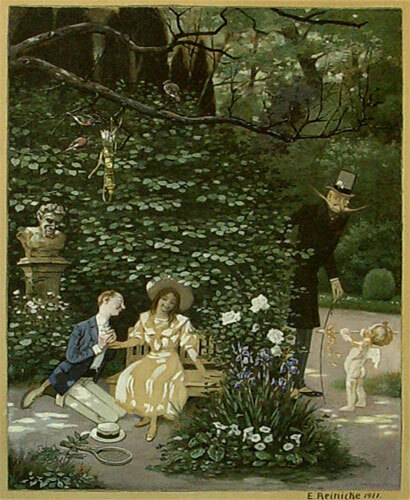 Reinicke was primary illustrator and been activ in Munich. As members of the „Fliegenden Blätter“ and the „Münchner Bilderbogen“. He illustrated books including „Lustiges aus der Thierwelt“ (Funny animal world) at 1900 and „Für Kinder die gerne lachen“ (For kids who like to laugh) at 1910, both published by Braun & Schneider. He studied at the Dresden Academy from 1876 until 1880 and in Munich from 1880 until 1882. Literature: Thieme-Becker, vol XXVIII, p. 134. Charming and humorous work of the Art Nouveau. Further details and price on request.